Included are two different versions of Pure Cane Cola, two different versions of Cream Soda, and two different versions of Strawberry Lime. As I write this, there are 233 6-packs left which really isn’t that much. Emily’s not your average thirteen-year-old girl. Pink is her worst nightmare . . . she wears the same black dress every day. She loves math and science. Her best friends are her four BLACK CATS! She’s into old rock and punk, but also digs newer bands like My Chemical Romance (BTW, Gerard Way is featured in her Dark Horse comic book, “Revenge at Last.”) Emily is so anticool she’s cool . . . A subculture of one, and a follower of no one but herself. Designers, including Jean-Paul Gaultier, Valentino, and Marc Jacobs, have paid tribute to her, but she doesn’t care! Emily wants you to be yourself, think for yourself, and DO IT YOURSELF. There’s nothing more boring to her than copying everyone else. Emily is the link to the Stranger in us all. Tagged Dark Horse, Emily the Strange, Jones Soda, the Goon. Bookmark the permalink. November-2011 When there was a “WOW” or “Tower” records, I had purchased a “Jones” sour apple POP. I am an avid consumer of diet non sugar drinks and Jones, does make some good ones including Bubblegum flavor. 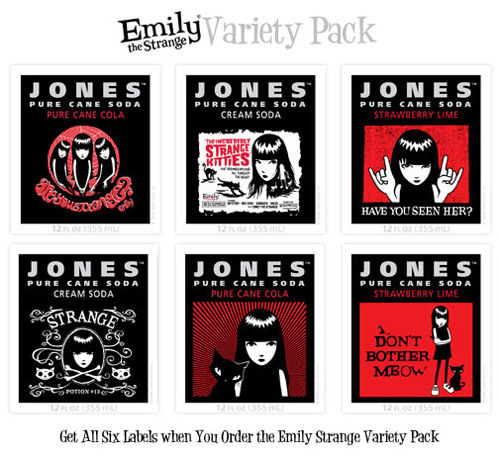 The Emily the Strange packaging and labels are Dar Ling, I would like one, but have not seen them in the Market? Ksh.